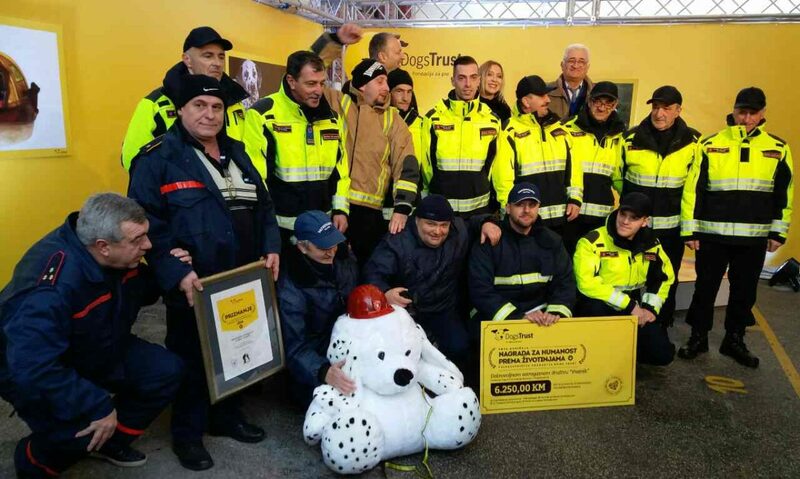 Dogs Trust Representative Office handed its Award and Medal for Humane Treatment of Animals to the Voluntary Fire Department “Vratnik” for their enthusiastic team’s readiness to help the entire community, including animals on 20th December 2016 in the courtyard of this fire department. The members of the voluntary fire department, Dogs Trust Representative Office, Local Authorities and many friends from the local community attended the event. The Award in total value of 6.250,00 Convertible Marks included two VHS analog Motorola radio stations, two sets of equipment for humane dog catching, three dog transport cages, and a professional training in humane dog catching. On this occasion, Anel Bećirović, the Head of the Dogs Trust Representative office handed the medal and a wall plaque in recognition of the team’s effort in saving animals and improving their welfare to President of this Department, Muris Domić. “Starting this Annual Award was inspired by frequent positive examples of humane treatment of animals within the community, and the rescue feats achieved by this voluntary fire department prompted us to begin this new tradition right away” said Bećirović and added that this award is “a sign of acknowledgement to the devoted team ready to be at service to the community when in need, but also understanding the importance of humane treatment of animals”. “This is only the beginning of our cooperation, and respecting this team’s wishes, next year we plan to provide this team with a trained dog to be a member of their team and help them in future interventions. All over the world, dogs are members of firefighter teams, police force, demining teams and numerous other important services”, concluded Bećirović. On behalf of his team, Domić handed a thank you plaque for Dogs Trust to Bećirović. “We are deeply touched by this acknowledgement of our work and the support from Dogs Trust. As a voluntary fire department, we believe in humanity and being humane towards animals is of great importance for a healthy and happy community. We are honoured to be the first recipients of this award and medal and we thank you for this valuable award that will enable us to respond to the needs of the entire community even better”, said Domić. Those who can be nominated for future Annual Award and Medal include organizations, institutions, associations, and individuals who contribute to improvement of the welfare of animals for the wellbeing of the entire community. More information about the specific criteria for nomination can be found on our website www.dogstrust.ba. Dogs Trust has been voluntarily supporting Local Authorities, and other actors and the whole community, through various programmes all aiming to help the establishment of a humane Dog Population Management (DPM) system compliant to the state no-kill animal welfare legislation, as the only sustainable solution to the stray dog problem.